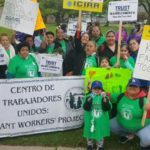 As Centro de Trabajadores Unidos: Immigrant Workers’ Project (CTU) approaches its ninth year anniversary as an organization, we continue to grow our labor, immigration and economic development work. This year our annual dinner will be key to helping with the expansion of future programs including worker cooperative development and the construction of our Southeast Chicago Community Center. We hope that you will be able to join us for a night of dinner, music and dance as we celebrate our successes of the past year and honor our Keynote Speaker, Keith Kelleher, President of SEIU Healthcare Illinois. 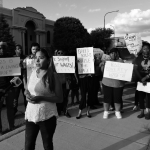 Over the last year we focused heavily on leadership development and capacity building with our members and took on new organizing campaigns to hold local employers and elected officials accountable to the workers in our communities. Every little bit of support will help with our continued efforts to increase outreach to workers and families from communities across Southeast Chicago and the South Suburbs. 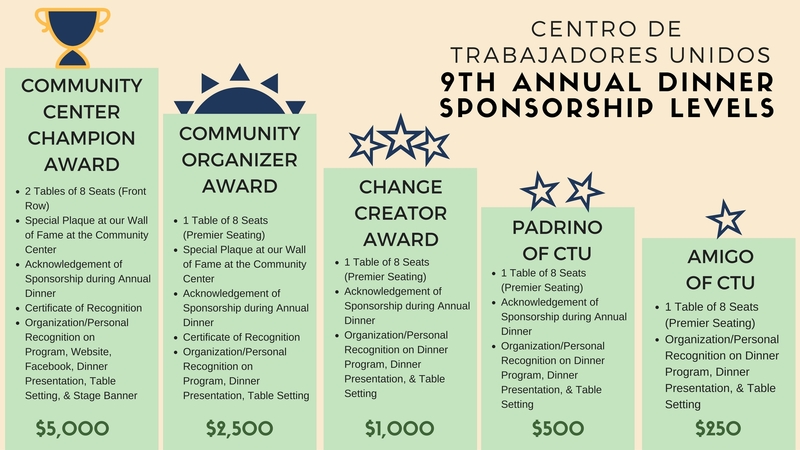 If you are interested in attending our annual dinner, please send a check or money order and return to: Centro de Trabajadores Unidos, 9546 S. Ewing Ave, Chicago, IL 60617. You can also become a Sponsor of our 9th Annual Dinner! All sponsorships must be confirmed by September 12, 2016 in order to be included in event marketing, materials and website. For more information about the 9th Annual Dinner and sponsorship opportunities, please contact Ana Guajardo at 708-790-7760 or aguajardo@ctu-iwp.org. ALL DONATIONS ARE TAX DEDUCTIBLE. Join Us For Our 11th Annual Dinner! Subscribe now to receive all the latest updates and upcoming events!